Jimdo is another easy-to-use website designer with integrated e-commerce. The free membership lets you list up to five items for sale, with Jimdo taking a 10 percent cut. The $15 Business membership lets you list unlimited items (and Jimdo takes no cut).The service also optimizes your site for the iPhone and other mobile devices. As with some of the other services here, creating a free website using Jimdo is easy. Just choose your subdomain, such as http://yourname.jimdo.com. Next, enter and confirm your email address--and you're ready to start building your site. Jimdo's website editor is a little more basic than Moonfruit's. Your page is set up with a default layout, but you can choose a different layout and move the elements around. 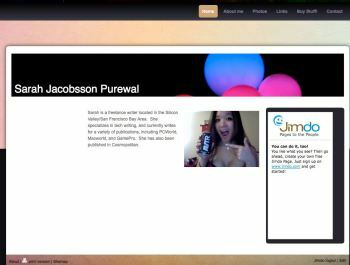 Like Weebly, Jimdo's free layouts look very similar to Wordpress-style blogs. However, the "Business" designs--which require a $15/month Business membership--are more attractive. Jimdo offers e-commerce for your site, but the free option plasters a large ad on your pages. Jimdo's website editor features a toolbar along the right edge of the browser, with a Layout button along with buttons for Style, Blog, Friends (you can connect with other Jimdo users), Messages (Jimdo integrates with Twitter), and more. You can easily edit each element--such as photo galleries or a store catalog--and move it up or down the page using arrow buttons or drag-and-drop mouse gestures. Jimdo's integrated e-commerce is especially nice because it allows you to have a shopping cart on your website instead of going through PayPal or Google Checkout. This is great, because your customers will be able to add multiple items to their carts without ever leaving your site before completing a purchase. Jimdo has three membership tiers: Free, Pro ($5/month), and Business ($15/month). Free membership provides 500MB of storage, and you can list up to five items in your store. Jimdo also takes 10 percent of your sales. Unfortunately, for free accounts, Jimdo ads appear prominently on every page. With the Pro ($5/month) membership, you can register one domain and email account (10GB). You also have access to Jimdo's Pro designs, get 5GB of storage, and can list up to 15 items in your store (Jimdo takes 5 percent of your sales). You also get a few features the free accounts don't get--no advertising, a hidden login, and the option to upload your own logo. With the Business ($15/month) membership, you can register up to two domains with 20 email addresses (10GB each). You get 50GB of storage and access to Jimdo's business designs. This is the best choice for online retailers, because the Business membership allows you to list an unlimited number of items in your store, and Jimdo takes no commission from sales. Jimdo Pros: WYSIWYG editor is extremely easy to use; integrated e-commerce is great; membership packages are affordable. Jimdo Cons: Huge ads on free sites; templates rather than themes; its sales cut is large unless you have the $15/month package. Yola is a full-featured website host and editor that lets you add e-commerce to your site through PayPal. Once you've gone through the preliminary registration for Yola, you'll choose a website category. Based on the category you choose, Yola will recommend pages for your website. For example, if you choose "Personal," Yola will recommend you have a blog and a photo gallery. Next, you'll be prompted to select a site style or theme. Yola has quite a few free and premium styles, though many are fairly basic. Yola's website designer is fairly full-featured--not only can you choose a theme, you can also choose different layouts for your pages. A toolbar across the top of the page is for adding and saving pages, choosing styles and layouts, and adding or deleting websites. Another toolbar is for adding elements to the page you're working on. Adding elements to your Yola site is as simple as dragging an element from the right-hand toolbar, and then dropping it onto your page. You can add everything from images and text to forms, maps, and e-commerce. Yola's drag-and-drop editor is simple to use, but limiting. You can't drag-and-drop items all over the page--only to various areas within your chosen layout. Yola does allow you to add unlimited products or product catalogs using PayPal. You must, however, have a PayPal Premier or Business account to sell products. Yola also offers e-commerce, but its design options are limited. Unfortunately, Yola forces you to upload files one at a time. If you don't have the perfect image, you can search through stock images via Fotolia--though, of course, these will cost you. You can purchase Fotolia image credits directly through the Yola website: 15 for $18, 30 for $33, or 50 for $52.50. Images typically cost between 1 and 15 credits, depending on size. Once you've finished perfecting your site, just click Publish to the Web. 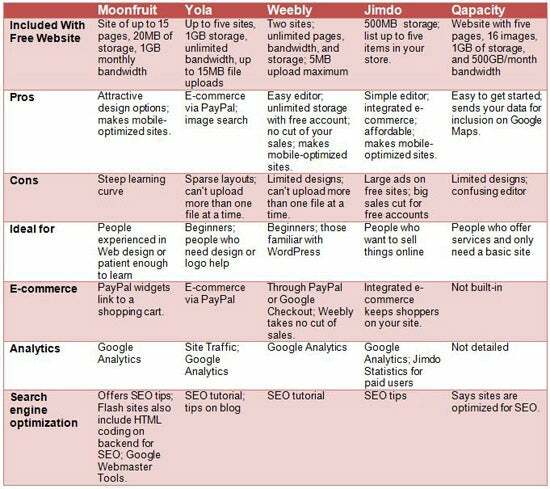 Yola has three pricing tiers. The free package includes up to five websites, 1GB of storage space, and unlimited bandwidth, and it lets you upload files of up to 15MB in size. Yola's Silver package costs $99.95 per year for 25 websites and 5GB of online storage space, and it lets you upload files of up to 100MB in size. With the Silver package you also get a custom domain name; access to premium templates; Google AdWords and Facebook advertising credits; and an HP Logoworks Logomaker credit. Yola's Premier package costs $499.95 per year, offering everything the Silver package gives you, plus a consultation with a professional designer and a professionally-designed, five-page website. Yola Pros: Image search, and unlimited e-commerce if you have a PayPal Premier or Business account. Yola Cons: Layouts are fairly basic and sparse. These are just five of the free, easy-to-use website builders out there. Although these all have free options, it's a good idea to choose one of the (cheaper) paid options for your small business. At the very least, you don't want a blatant ad for a website builder splashed across your page. Moonfruit is the best option for users who are a little more experienced with Web design, and who have a good idea of what they want their website to look like. It also features a full library of stock images, videos, and widgets that you can add at no extra cost. If you're willing to spend a lot of time toying around with visual elements, you can make your Moonfruit site look as though you hired a real Web designer (and a good one). Plus, the service optimizes your site for mobile devices no extra charge. Qapacity is a basic website designer with a social network, but its community is so small that you're better off focusing your social media efforts on larger networks, like Facebook and Twitter. 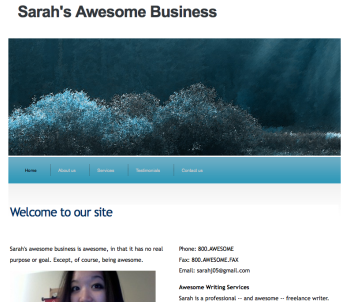 Weebly, Jimdo, and Yola all start you off with a basic, blog-like template--little more than what a free WordPress account offers. Still, all of these sites will let you customize within reason, especially if you're a paying customer. Weebly is the simplest to use, while Jimdo has a nice integrated e-commerce feature. Yola walks you through the website set-up and even suggests which types of pages you should have, so it's an excellent choice for beginners. It also offers e-commerce, but shoppers pay through PayPal.